The apartment began as three separate but small units within a new-build condominium development purchased with the intention of breaking down the walls to create one single residence. Sothea's design included an open-plan living room, dining area, and kitchen, a master suite with an office included, and two separate balconies. 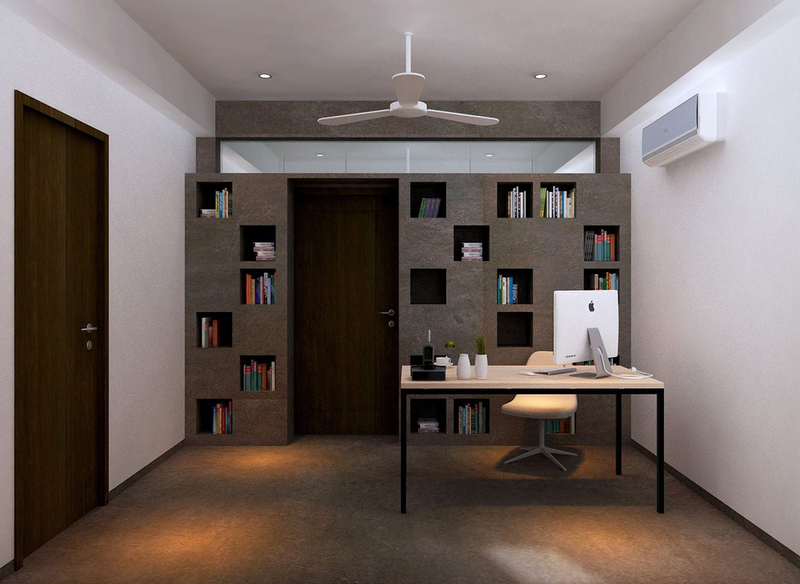 The design of the space transformed three small one-bedroom units into a single livable apartment with enough room to both entertain friends and ensure privacy in the bedroom and home office. One of the major sources of inspiration for the design stemmed from the homeowner's request for a space to hold his large collection of books. This request led Sothea to design a set of walls that incorporated the bookshelves while minimizing further division of the overall space. Sothea's plans also incorporated custom features like a built-in bedframe and a small window with a controllable shade for light to enter the bedroom. The apartment is located near Wat Sansam Kosal pagoda, in Boeung Tumpuon, Phnom Penh.